Investors’ concerns are misplaced, however, because there’s little evidence that the volatility of EM currencies has a meaningful impact on their portfolios. Most investors are exposed to foreign currencies through investments in overseas stocks. 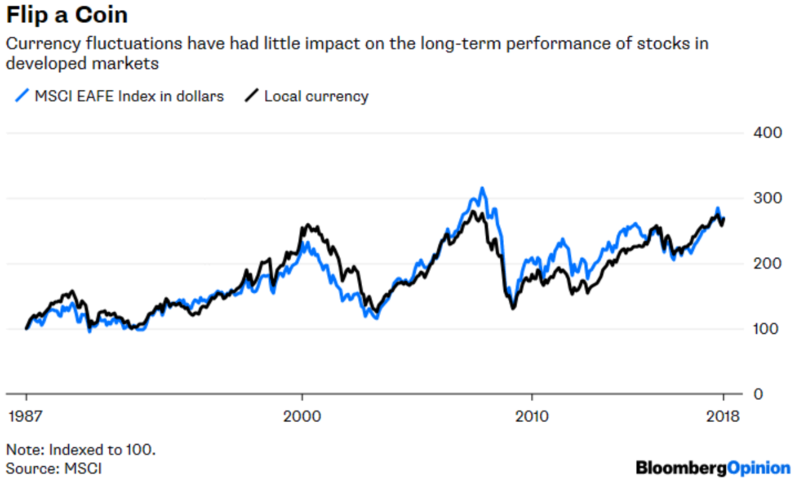 One way to gauge the volatility of those currencies is to compare the return from overseas stocks in dollars — which is subject to currency fluctuations — with the return in local currency — which isn’t. 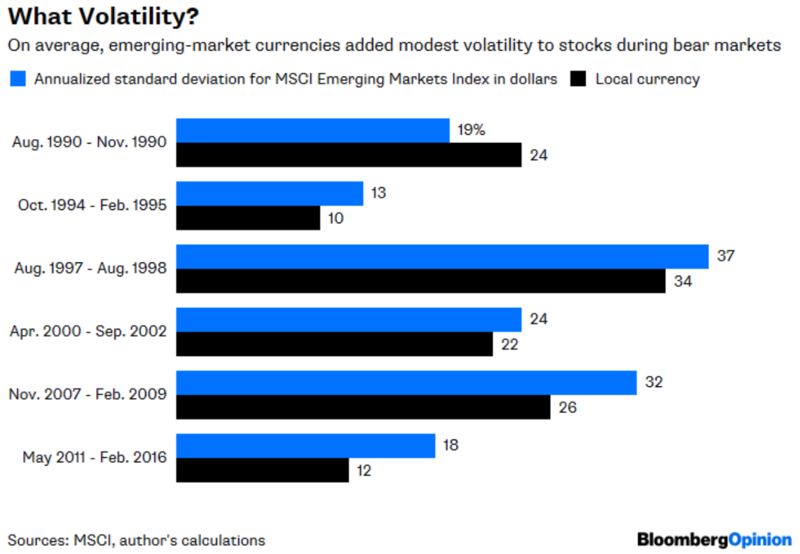 Consider that the standard deviation of the EM index has been 21.4 percent in local currency from 1988 through April — the longest period for which numbers are available — compared with 22.6 percent in dollars, or 6 percent more volatile. In other words, EM currencies have added only modest volatility to the return from emerging-market stocks in dollars. In fact, the incremental volatility from foreign currencies has been higher in developed markets. 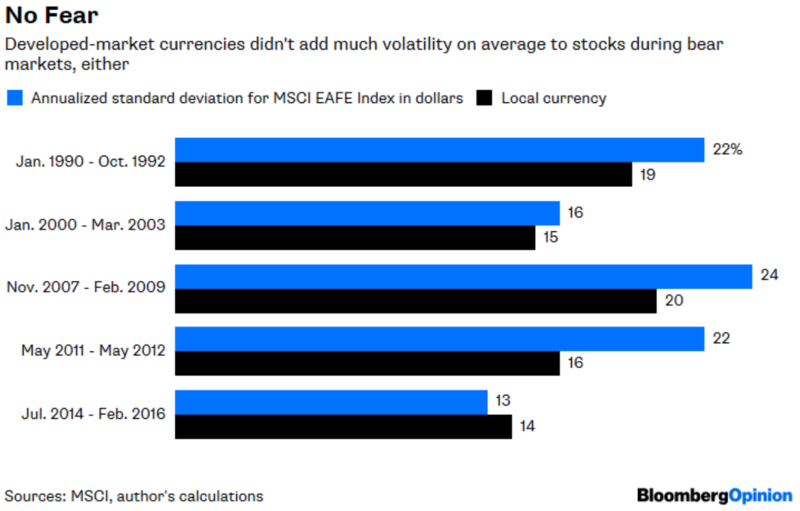 The standard deviation of the MSCI EAFE Index — a collection of stocks in developed countries outside the U.S. — has been 14.6 percent in local currency from 1988 through April, compared with 16.7 percent in dollars, or 15 percent more volatile. Nor is that incremental volatility meaningfully higher during downturns, when investors reputedly flee to the dollar for safety. I counted six episodes since 1988 in which the EM index was down 20 percent or more. The average standard deviation during those periods was 21.6 percent in local currency and 24.1 percent in dollars, or 11 percent higher on average. Here again, developed-market currencies kicked up more volatility. I counted five drawdowns of 20 percent or more for the EAFE index since 1988. The average standard deviation was 17 percent in local currency and 19.5 percent in dollars, or 15 percent higher on average. So for most investors, the problem with EM currencies isn’t volatility. Instead, the real threat lurks in another conventional wisdom: That currency fluctuations even out over time. It’s an appealing assumption, and there’s some evidence for it. The EAFE index has returned 3.3 percent annually from 1988 through April in both dollars and local currency. But that assumption hasn’t held up in emerging markets. The EM index has returned 23.6 percent annually in local currency from 1988 through April, but just 8.4 percent in dollars. EM currencies, in other words, have depreciated a lot relative to the dollar over the last three decades. That’s not the only thing that has changed. 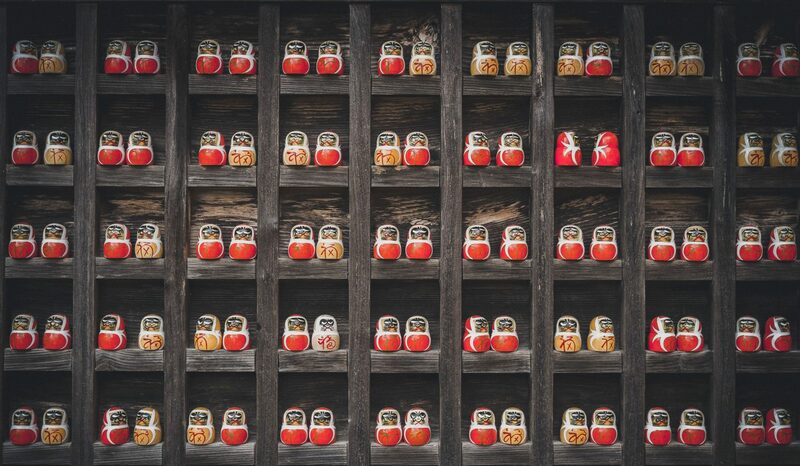 A growing number of emerging-market stock mutual funds and exchange-traded funds hedge their currency exposure, which means that investors can invest like locals. The only catch is that currency-hedged funds are generally more expensive than unhedged ones. In hindsight, currency-hedged funds would have been a boon to emerging-market investors had they existed three decades ago. But it’s not obvious that the higher cost of hedging will pay off going forward. 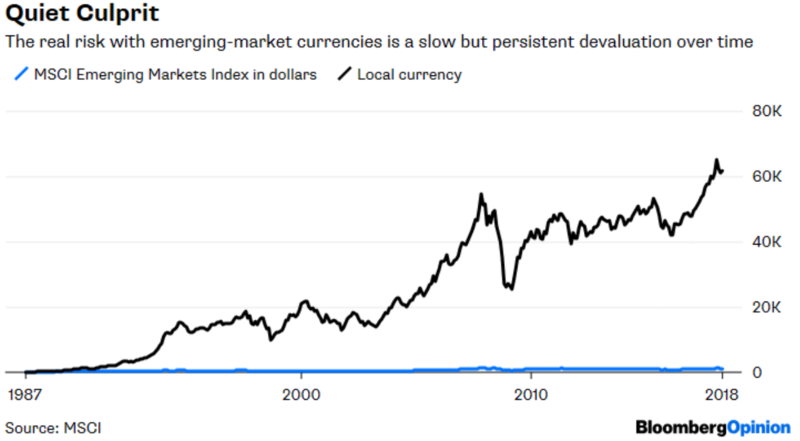 As my Bloomberg Opinion colleague Robert Burgess pointed out recently, there are good reasons to believe that developing countries are better able to defend their currencies than ever before. And despite all the tumult in places such as Turkey and Brazil, emerging markets are generally more stable and financially savvy than in decades past. All of that should firm up their currencies. 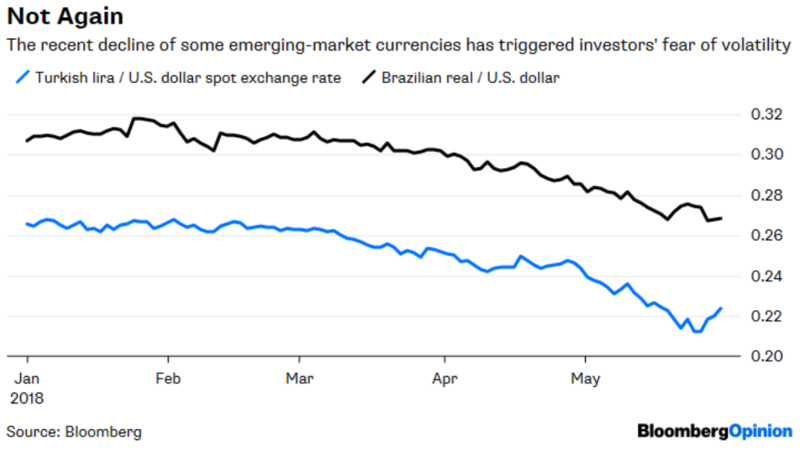 Still, as the frantic warnings about EM currencies pile up, investors should bear in mind that the real gamble isn’t the fleeting ups and downs. It’s the risk of a slow decline that goes unnoticed until three decades have passed. Previous PostPrevious Welcome to the Alternative-Investment Party. You’re Late.